At Oregon’s Finest we like to think of all our products as “top shelf” (we are Oregon’s Finest after all). This means a variety of things. Over 60% of our products sold are “Clean Green Certified” which means that the cannabis is cultivated using sustainable, natural and organically based practices. Legally, cannabis cannot be called organic — no matter how environmentally friendly the cultivation practices used to grow it — because the term is federally regulated, and the USDA does not recognize cannabis as a legitimate agricultural crop. 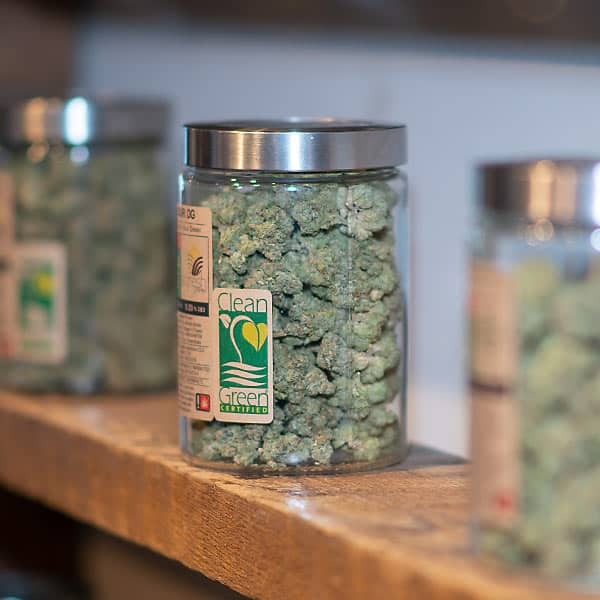 We carry award winning strains from award winning farms – the trophies of which you can see proudly displayed on our shelves. We take pride in knowing that we carry the best products so that you, the customer, can have the best cannabis experience whether you’re a regular user, a first- timer, or somewhere in between. As a company we value the practice of sustainability, which reaches beyond just being mindful of our impact on the planet (which we are). We also strive to preserve the long-term viability of our people – which means paying our employees a living wage, offering insurance, and cultivating a healthy work environment. Many of the farms we work with also take these practices into consideration, which factors into the cost of their product. Do you offer a discount to medical/OMMP patients? Yes! In addition to patients not paying the state mandated 20% cannabis tax, we also offer an additional 20% off all recreational products. Do you offer a discount to veterans? Yes! Just let your grower representative know that you’re a veteran at the time of purchase. Cannabis cannot be smoked or consumed in a public place. The OLCC considers any establishment with a state liquor license to be public, including patios or decks set aside for smokers. In addition, smoking and vaping in most businesses is limited by the Indoor Clean Air Act. No. Unfortunately we cannot accept cards, however we do have on-site ATMs. What IDs do you accept? In order to enter a dispensary or buy cannabis you must present a valid ID. An unexpired and unaltered U.S. state or District of Columbia driver license. Islands, or American Samoa, with photo, name, date of birth, and physical description. An unexpired and unaltered ID card issued by a federally recognized Indian tribe with photo, name, and date of birth. An unexpired and unaltered passport or unexpired and unaltered passport card. An unexpired and unaltered U.S. military ID card. * A cannabis retailer may require ID from a person in addition to what is listed above only if the ID is the person’s registry identification card. *We CANNOT accept Nexus cards – if you are traveling from another country outside of the United States you will need to present your passport. Can I bring the cannabis I purchase to another state? No – crossing state lines with cannabis is a federal crime. This applies even when crossing from a state that has legalized cannabis into another state that has legalized cannabis. Can I bring a minor into the store if they don’t buy cannabis? No. You must be 21 years or older with valid ID to enter a dispensary.